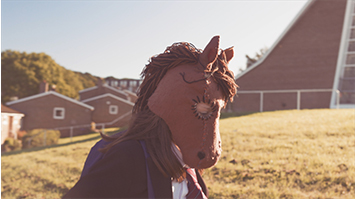 Heartening anti-bullying short film TRiGGA, directed by LSBU’s award-winning Film Practice Lecturer Meloni Poole, has been selected to screen at the Toronto International Film Festival KIDS. Based on events from Meloni’s own life, TRiGGA follows Mae as she confronts her bullies with the help of her horse. As physical assaults become a daily reality, Mae’s only escape is by galloping out at twilight on her trusty steed, Trigga. Everyone thinks Mae’s horse is a figment of her imagination until she takes Trigga to school. Meloni said her own horse was her guardian angel, and gave her the inspiration for the film. “Facing my fears, I confronted the girls who were bullying me by taking my horse to school,” she said. “Horses gave me the confidence to be myself and not disappear but say ‘Here I am’. “I was lucky my horse saved me, but many girls are not so lucky and I wanted to make a film where love wins out over cruelty and meanness. The film was part-funded by the Creative England iShorts scheme together with the BFI NET.WORK, and crowdfunded through Crowdfunder UK. The 16-minute short is aimed at young girls, aged between 11 and 13, and explores how to overcome bullying and create supportive friendships. The film will be shown as part of the True to Me short film program at the Toronto International Film Festival KIDS from April 13 to 22.